Each year since the time of the Buddha, at the end of the three-month Rains Retreat, the lay community around every Buddhist monastery has gathered to celebrate the completion of the retreat and to offer to the monastic community gifts of cloth and supplies that will be useful for the coming year. The cloth is then cut, sewn and dyed to make a robe on that day to offer to one of the Saṅgha. 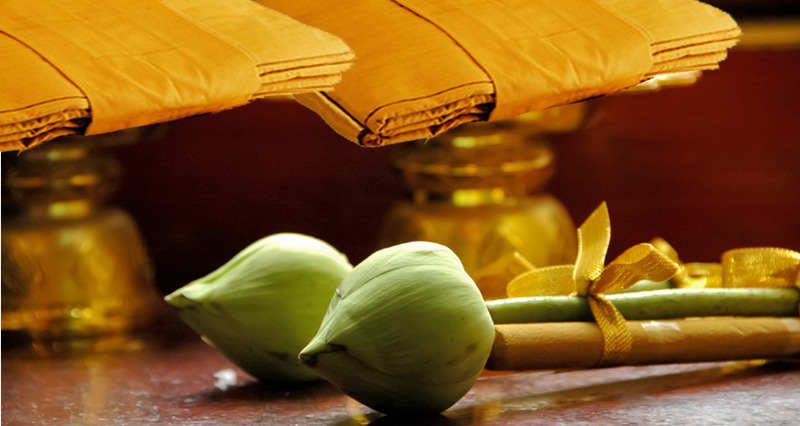 This 2,500-year-old tradition is still carried on here in the West in the Theravadan monasteries. It is initiated by a lay supporter or a group of supporters who request to organize the preparation and formal offerings. It is both a significant and joyful occasion acknowledging the relationship of friendship and mutual support between the lay people and the monastics. All year round, the monastery functions solely on offerings from the lay community. This year, we are very grateful that the laypeople have offered to host KBV's second Kathina. We're very excited to have monastics from several monasteries attending. We hope you can join us on Sunday, October 23 for the celebration. If you'd like to contribute to the maintenance of the vihara, please see our Dana Wish List and financial contribution pages. ​Invitation flyers available for download below. Please share with your friends!